SEB's result for the second quarter 2015 will be announced on Tuesday, 14 July, at 07:00 (Swedish time). In addition, presentations and the Fact Book will be available on www.sebgroup.com/ir. To participate, please call +44 (0)207 1620 177, quote conference id: 954026, at least 10 minutes in advance. Please confirm your attendance to the London presentation to Per Andersson, by e-mail per.andersson@seb.se as soon as possible. 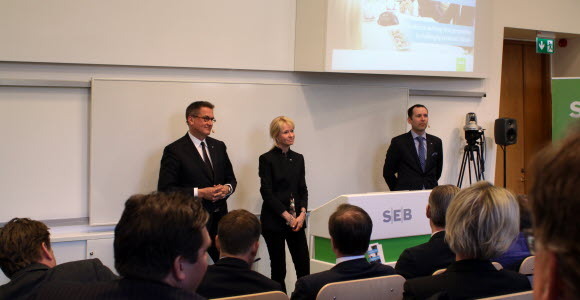 SEB is a leading Nordic financial services group. As a relationship bank, SEB in Sweden and the Baltic countries offers financial advice and a wide range of financial services. In Denmark, Finland, Norway and Germany the bank's operations have a strong focus on corporate and investment banking based on a full-service offering to corporate and institutional clients. The international nature of SEB's business is reflected in its presence in some 20 countries worldwide. On March 31, 2015, the Group's total assets amounted to SEK 2,979 billion while its assets under management totalled SEK 1,832 billion. The Group has about 16,000 employees. Read more about SEB at www.sebgroup.com .